Expand your knowledge and understanding of your pleasure of cigars - experiment! 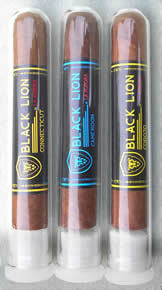 To make it easy for you to start experimenting we have put together cigars in glass tubes at exceptional prices. The selection includes a leaflet describing the cigars. They're available now - until they are sold out. If you miss out now, watch the website or visit the shops - every month there's something good to try. Tobacco and Cigar prices and availability change regularly. we have removed most prices from the website. (5) (a) No person shall sell, offer to sell, supply, distribute or buy any tobacco product through the postal services, the internet or any other electronic media. (b) The prohibition contained in paragraph (a) does not apply to any commercial communication between a tobacco manufacturer or importer and its trade partners, business partners, employees and shareholders. from all pure tobacco products on the website. If this affects you, please contact us regarding a stockist of these tobacco products in your area. elegant, sturdy, sliding Travel Case. Cohiba – Made from a selection of the best tobaccos from the Vuelta Abajo region, Cohiba’s special third fermentation process gives it a unique aroma and flavour. It is the flagship brand of Cuba. Montecristo – The best known and probably the most appreciated Cuban brand, its distinctive medium to full flavour forms for many Cuban cigar smokers the benchmark against which other brands are judged. Romeo y Julieta – The balanced and aromatic blend make it the classic medium-bodied Cuban cigar. Partagas – Immediately recognised by its deep character and rich earthy flavour. Hoyo de Monterrey – The flavour of this blend makes it an attractive choice for those who seek a delicate yet aromatic Cuban cigar that is lighter to the taste but with great elegance and complexity. Certain of the sizes are not available in any other packing – for example, Montecristo classic Robusto, Cohiba Torpedo. In South Africa, since before the 1970’s, the Hoyo de Monterrey Epicure No.2 has been revered as the ultimate smoke. This popularity was created purely by the dimensions of the cigar, not necessarily by the blend or taste. The attractions are the easy draw, the volume of smoke with each puff, and the slow development of the full flavour of the blend. This size (also called Rothschild) is still one of the most popular in any brand in which it is made – Cuban and non-Cuban. But today, because time is often short, there is a demand for a shorter version of the Robusto – a Petit Robusto. Length 90mm x Ring 50. The dilemma was that a thick cigar was what the smokers wanted. How to make shorter cigars with such large ring gauge? In 2004 the first shorter version of the classic Robusto was presented to the market by Hoyo de Monterrey – the Petit Robusto (102mm x Ring 50). It was successful. The smoking time of 25-30 minutes was good, but it lacked something. That “something” was the requirement of a modified blend to develop the flavour fully in the shorter time. It couldn’t be just a cut down version of the Epicure No 2. The blends in today’s Petit Robustos are created to develop the full flavour over the shorter length, allowing a satisfying smoke to develop in the shorter time available. Click here to read more about the Petit Robusto shape. This shape, broad at the burning area and tapering to a comfortable ringsize for the mouth, has long been revered as the ultimate in Cigars – rare, but a superb smoke. It has always been understood that the cigar is technically difficult to roll. The basic difficulty comes in tapering the 50 ring size foot down to a pointed head without interfering with the free flowing draw. Only the most highly skilled rollers can achieve this - hence the scarcity of the cigar. about the “Torpedo” / “Pyramid” / “Belicosos” shape. For all cigar smoking the rule is: sip the cigar, like a wine-tasting, roll the smoke around in your mouth to savour the flavour, then gently let it out. If you draw too fast the smoke becomes hot and bitter. A cigar that has gone out can simply be re-lit. Cigars do not contain additives to keep them burning so if/when your cigar goes out, gently tap off the loose ash, blow through to expel stale smoke, re-light and continue to enjoy it. A cigar can be "doggy-bagged". Allow it to go out, then cut off the ash end (about 1cm, for cleanliness) and store in a glass tube until you are ready for it. Blow through before re-lighting to expel stale smoke. Read Rudman's "Complete Pocket Guide to Cigars". Sales of Tobacco Products to over-18's only.